Built by Lürssen Yachts and commissioned by Khalifa bin Zayed Al Nahyan, the president of the UAE, Azzam is the largest private motor yacht in the world. Yachts are a type of luxury boat. What Is A Luxury Yacht? 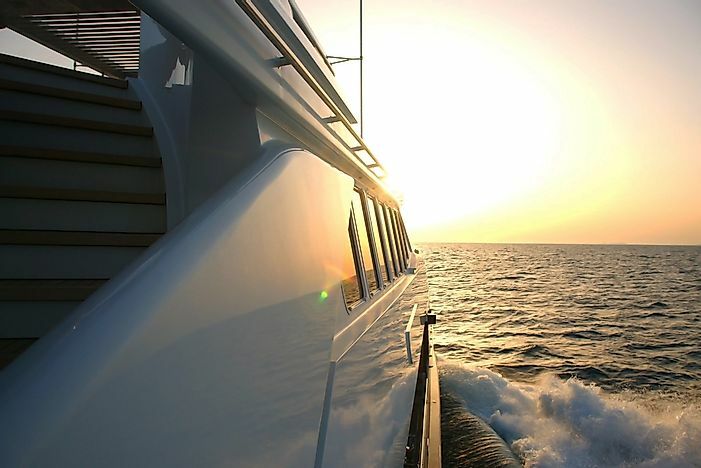 Luxury yachts are large and extremely expensive sea-faring vessels. Generally, these ships are privately owned and staffed by a professional sailing crew. In some countries, yachts that reach above 79 feet in height must maintain a permanent staff onboard. Luxury yachts first became popular in the early 1900’s, when they became a symbol of wealth and pleasure. Additionally, yachts may be powered either by sails or motors. In 1908, the longest motor-powered yacht in the world measured 11 feet in length. It was known as the Jemima F. III and was owned by Charles Henry Fletcher. Yachts took off in popularity between 1997 and 2008, sometimes being built with lengths measuring over 200 feet. This article takes a look at some of the longest motor yachts d today. The Azzam is currently the longest motor luxury yacht in the world at 591 feet in length. Its tallest beam stands at 69 feet and 4 inches. Its draft, the distance between the waterline and the bottom of the hull, measures 14 feet and 1 inch when empty. This is considered a shallow draft for a boat of this size. Construction of the Azzam was commissioned by the President of the United Arab Emirates, Khalifa bin Zayed Al Nahyan, at a cost of $605 million. The Azzam was delivered to its owner on September 9, 2013. On board, this luxury yacht has its own military system, which consists of missiles and a submarine. The Eclipse is the second longest motor luxury yacht in the world with a length of 536 feet. Its tallest beam stands at 72 feet and 2 inches. Its draft measures 19 feet and 4 inches, around 5 feet deeper than the previously mentioned Azzam. Construction of the Eclipse was commissioned by Roman Abramovich, a Russian politician, businessman, and investor. Its final cost was around $500 million. This yacht was first launched on June 12, 2009 and became officially in service on December 9, 2010. On board, the Eclipse has a missile defense system, 2 helicopter pads, 2 swimming pools, and 24 guest rooms. The third longest motor luxury yacht in the world is the Dubai, which measures 531 feet in length. Its tallest beam stands at 72 feet and 2 inches and it has an overall height of 30 feet and 5 inches. Its draft, when empty, measures 16 feet and 5 inches in depth. Its current owner is the Prime Minister of the United Arab Emirates, Sheikh Mohammed bin Rashid Al Maktoum, who also holds the position of ruler of the Emirate of Dubai. Originally, construction of this luxury yacht was commissioned by Prince Jefri Bolkiah of Brunei. In 2001, however, ownership switched hands to the Sheikh, when he acquired the ship’s hull from Platinum Yachts. Its total construction cost is estimated at $400 million. Prior to being owned by the Sheikh, the Dubai has held several names: the Golden Star, the Panhandle, and the Platinum. The chart published below offers a more complete list of the longest motor luxury yachts in the world.